First let me say this isn’t supported. But then again Windows Server 2003 is no longer supported anyways. Even if you have a Custom Support agreement, that just gives you the latest security hotfixes. Not support to monitor it with SCOM. I have been to many customers recently that want to upgrade to SCOM 2016 but can’t because they have a significant number of systems still running Server 2003. One option is to setup a new environment running SCOM 2012 R2 and move the old 2003 servers to the new environment. Then upgrade the existing environment with the majority of their servers to SCOM 2016. This creates more overhead keeping the two systems running and up-to-date. You cannot install the SCOM 2016 agent on SCOM 2003 as the installer will fail. But you likely already have a SCOM 2012 R2 Agent installed. The differences in the SCOM Agent from SCOM 2007 to SCOM 2012 were major as we changed from XML 1.1 to XML 2.0 and included MP Binaries. 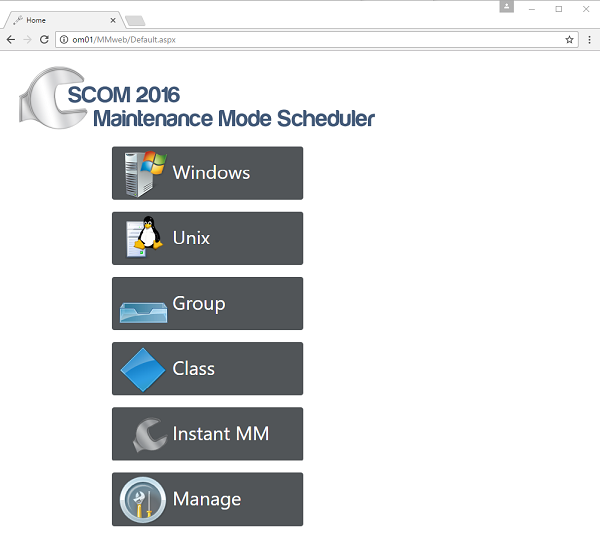 The changes from SCOM 2012 R2 to SCOM 2016 are relatively minor. So, all we need to do is point the SCOM 2012 R2 Agent at SCOM 2016, right? Maybe. In my testing a Server 2003 system with a SCOM 2012 Agent, pointing at a SCOM 2016 management server went green but then went grey. Why is this happening? Many of the new management packs in SCOM 2016 require PowerShell. By default, PowerShell is not part of the Windows Server 2003 OS. To fix this follow these steps. First we need to get WMI working. Apply these Server 2003 hotfixes from Kevin’s list of recommended hotfixes. Then we first need .net 2.0 SP1 as it’s a prerequisite for PowerShell. Now I can see the Windows Server 2003 Server is being monitored. You may also want to disable the “Microsoft System Center Advisor Monitoring Server Opt-In/Out Rule” on these 2003 Systems as I have seen this fail. This management pack will help you identify which of your 2003 Systems are missing PowerShell. 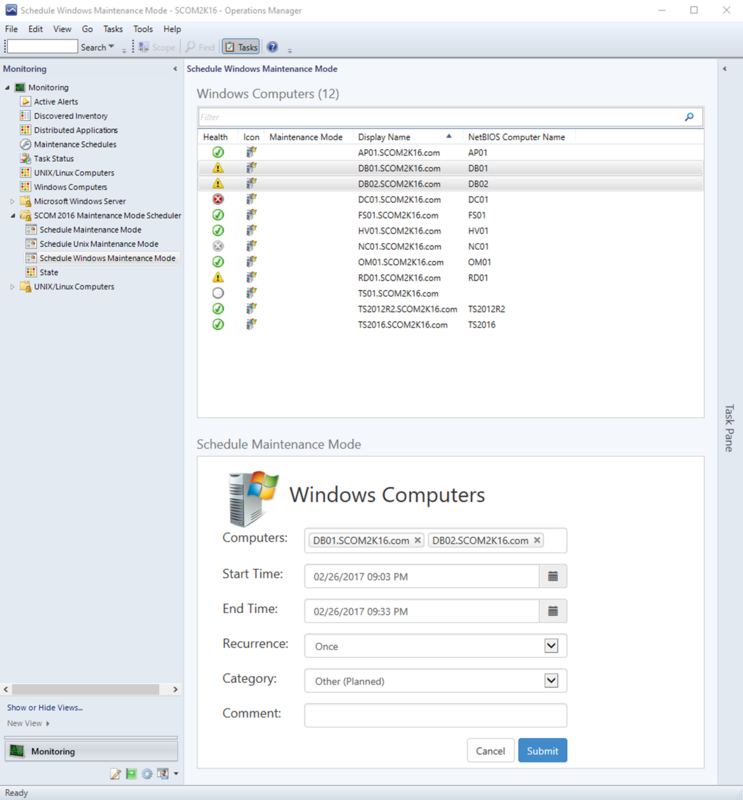 There is a bug in SCOM 2016 where if you choose a different Operations Manager Database Name during install, schedule maintenance mode won’t work! The Jobs will run but nothing is put into Maintenance Mode. You won’t get an error in SCOM or in the event log. 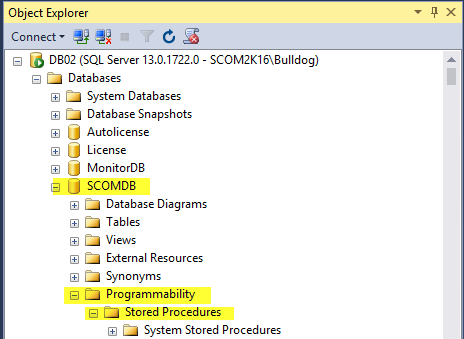 The stored procedure has ‘OperationsManager’ hard coded as the Database name so it fails! The workaround is to change the stored procedure that creates these Schedules. You will have to delete all your Schedules in the console. Now they run without issue. This is a known bug and will be fixed in SCOM 2016 UR3.